What's the deal with crowdfunding investments? Rick Field, owner of Brooklyn-based Rick's Picks, can publicly solicit investors thanks to a rule change made under the JOBS Act. A rule changed in September that transformed the way small business owners can seek investment, but it appears to be flying under the radar. The new rule allows private companies to publicly advertise that they are seeking investment, known as "general solicitation." Part of the JOBS Act, it aims to make it easier for smaller companies to access new investors and raise capital -- something a majority say is their biggest challenge. For the past 80 years, startups that wanted to raise money couldn't publicly say they were seeking investment. They couldn't mention it at speaking engagements, post an announcement on their website or tweet about it. That's all changed. 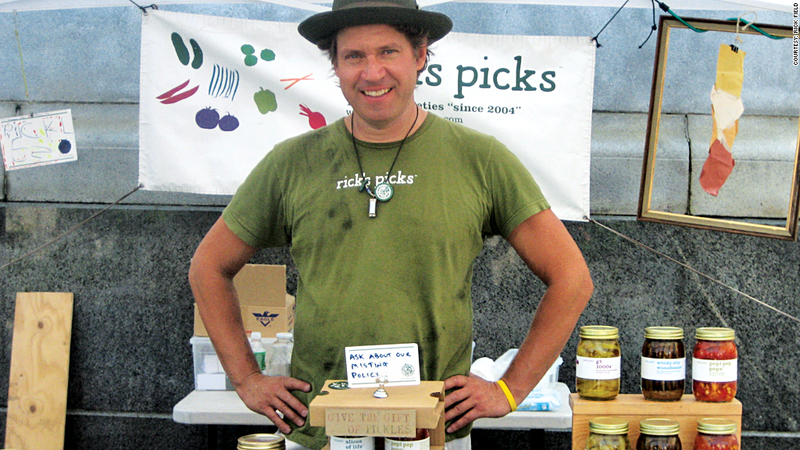 "I've seen an entirely new class of individuals taking a look at my business now," said Rick Field, CEO of Rick's Picks, a New York-based company selling specialty pickles and beets. Field -- one of the small number of business owners to take advantage of the new rule -- has seen three times the traffic to his fundraising profile on the crowdfunding site CircleUp. Though he says it's too early to tell if that will lead to more investment, more and more people are discovering Rick's Picks -- and they could become investors down the line. Shahab Kaviani is the CEO of CoFoundersLab, an online matchmaking platform connecting entrepreneurs with business partners. He also took advantage of the rule change in September by tweeting and blogging about his fundraising campaign. Since then, Kaviani has received about $150,000 in investments, and he says half of those investors were the result of general solicitation. "It's really going to help startups all around. They can sell out loud, which is going to give them more exposure, more quickly," said Alejandro Cremades, CEO of the crowdfunding platform Rock the Post. His website launched in 2012 and helps startups raise funds. Unlike crowdfunding sites Kickstarter or Indiegogo, Rock the Post allows entrepreneurs to sell shares, as does CircleUp, a site for consumer product companies. Yet businesses haven't been lining up to publicly solicit investors. Only about one-third of the 66 startups currently using Rock the Post have taken advantage of the general solicitation rule, while just six of 34 companies on CircleUp are using it. Advertising for investment really only works well for businesses with a tangible product like pickles, or those with an already established social network, said Cremades. The National Federation of Independent Businesses and the Small Business Majority are not yet tracking the extent that small firms are using general solicitation. That may be because the JOBS Act in its entirety has yet to take effect. Although the new rule allows business owners to tell the world they're raising capital, that doesn't mean they can take money from just anybody. Only accredited investors -- those who have a net worth of more than $1 million or have earned $200,000 in each of the previous two years -- can pony up funds. The burden to verify these investors is placed on the fundraiser. And once a business owner opts to solicit publicly -- done by filing out a fairly straightforward form with the SEC -- he or she can't take any funds from a non-accredited investor, which means passing up investments from family or friends they might otherwise have received. The SEC is eventually expected to loosen that limitation. "General solicitation is a step in the right direction, but without that second part we're still not opening up to a broader population," said Rhett Buttle, vice president at the Small Business Majority. Ryan Caldbeck, the CEO at CircleUp, believes the rule change is significant regardless. There are millions of inactive investors that already meet accreditation standards, he said. The change helps small business owners reach them.